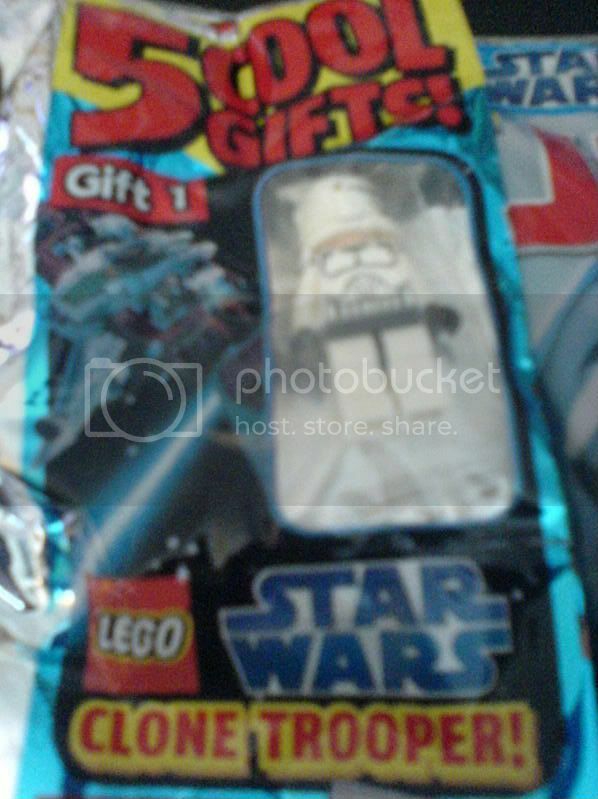 I just wen't on Jedi News and i found out that Clone Trooper minifigs are being given out for free in the summer special of Jetix magazine. Apparently there are 45,000 of these and the magazine costs �3.99. So hurry to your newsagents before they run out! Really? Cool! Thanks for telling us. Im not sure. Have you got Jetix magazine over there? I don't think its for the US because when you read an article on Wikipedia and it has the Sub-Catogories that the article is featured in, they were "British Magazine's" and "Childrens Magazine's". Although an article said it was in Turkey, so you never know. Anybody know if any of the major UK outlets like WH Smiths stock this magazine? Yeah where is Jetix magazine acctually sold? Damn, not in North America. Thank you "captain REX", thankfully I remembered this topic while I was in Boscombe today, while I was in a TESCO's. 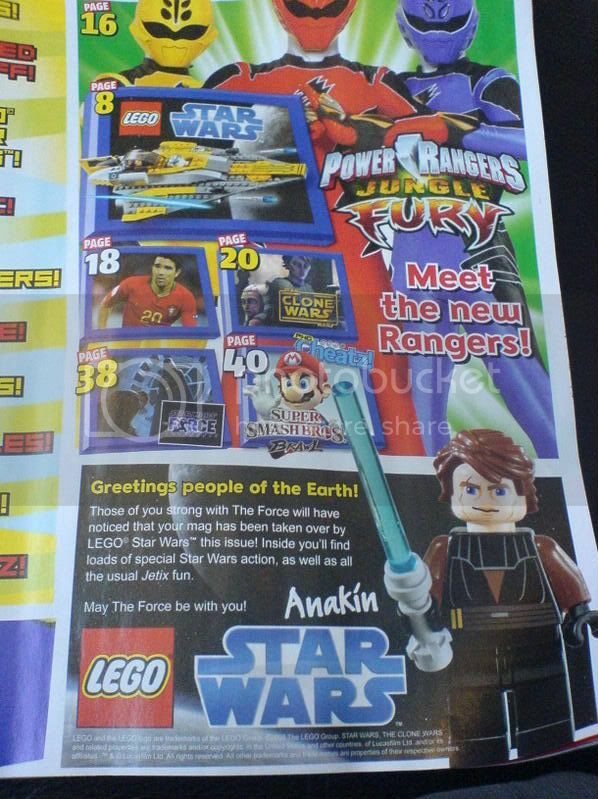 Even though I had read on the site kindly provided by "Anakin Solo" that said this magazine would be out on the 14th I went over to check the magazine section. 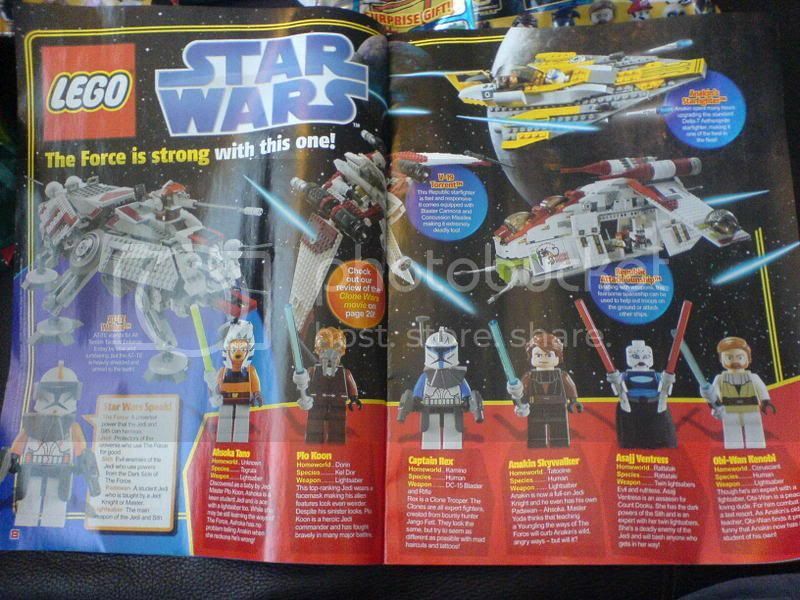 When I got there right at the front I saw this little clone trooper ( I wouldn't have checked the magazine section had "captain REX" not posted this) on the Jetix magazine. I could only get one but will probably buy a couple more later , I love those new clones. 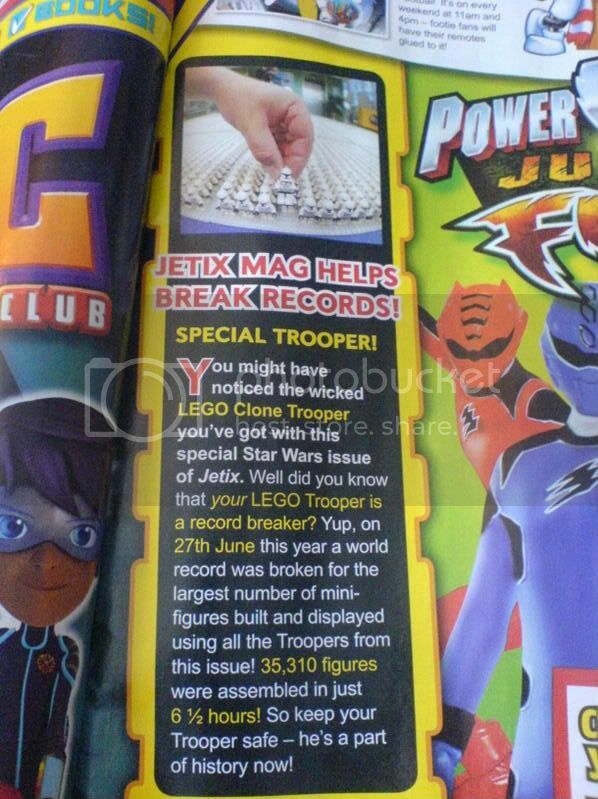 They even had a little thing in the magazine about the world record for number of minifigs displayed at once, and each trooper is one of them... which I thought was sweet for the Children. The count is 35,310 clones. So I know the big 24 hour TESCO's should stock Jetix, as I found mine in one, so my guess is that it'll be in WH Smiths and Woolworths as well. 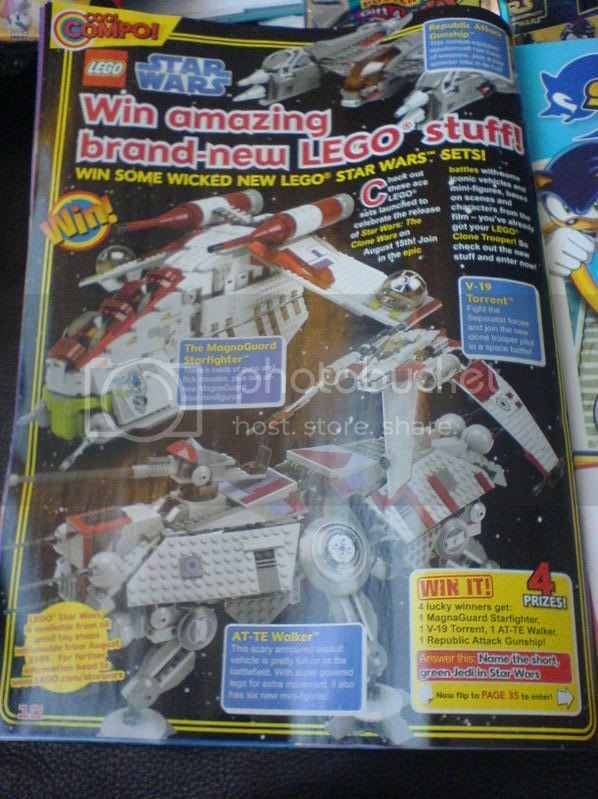 I'll probably enter the competition to win the LEGO sets, even though I'm far too old. So thanks again "captain REX"
I forgot to add that Jetix, while being a childrens magazine just giving away these troopers, really put care into the clones. The clone is not just stuffed in a little pocket in the outer magazine case, but also in one of those little re-sealable baggies, which meant he's in perfect condition. I thought that was a nice touch and deters clone-thieves slightly. The magazine is stocked by WH Smiths too. No sign of it at Woolworths. Would non UK folks be interested in these ya think ? Are they really worth �4 each?! Market economy is full of wonders. Maybe that price might drop a little with 45,000 of them in circulation this week. i suspect you're right ... you think a sealed magazine will become a collectable ? Oh definitly !! I have learned doing flee markets for the fun that people do collect everything, even stuff you wouldn't suspect: people's trash = people's treasure (ok its over exagerated but you get the point ). There were lots of copies on sale in Tesco and got three.. one each for my sons and who are actually within the magazines target age range! The figures made a cool addition to our first CW set; a V-19 and which coincidently arrived yesterday courtesy of a cool FBTB member in the US. The third unopened copy has been put away for posterity. I hope that this 'giveaway' is a big success for the magazine and that they or one of their competitors might consider doing something very similar again. Captain Rex next month please. Being stuck here in the US I'd love to get my hands on one of those Magazines as it's a neat side piece. Unfortunately I don't want to be financially raped just to get the magazine & figure. Can this really be called a giveaway if you have to buy a magazine for it? It's a giveaway of sorts... we're giving away our money? I thought it was worth �4 for the figure, considering the prices on eBay, and the lack of minifigures obtained when purchasing the new sets. I think the magazine will have it's biggest sales figures ever because of this, and most of the time the magazine won't be read. Luckily I know some younger children that might like my excess magazine. It is the cheapest way to get a new clone, BL has 'em going for 10+ bucks a pop. I'm still not sure it's a great way to "build an army" though. 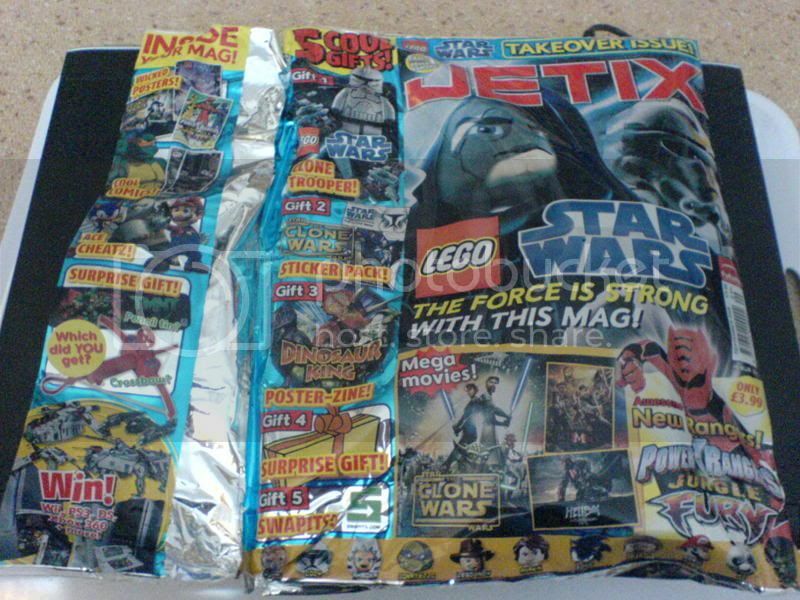 Maybe some of the Jetix 'giveaway' magazines will find their way overseas onto the stands at airports. For the army builders I imagine that Lego will release a battle pack with these new clones. 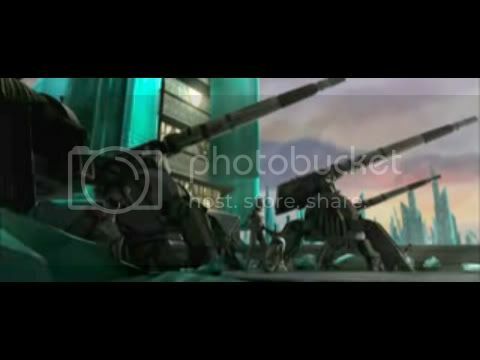 One of the cannons that featured in the extended action scene preview of the movie would make a cool lego set with four clone troopers. Yay im going to Tescos today! So hopefully i can pick one of these up. yay! They may get to airports, but most likely not, seeing as I have only seen TESCO's and WH Smiths stock them, so they can't be that popular. I went to Waitrose and just glanced through the magazines, no sign there. If they do a battlepack, I'm sure it'll be another made up vehicle, probably another speeder. But I agree with that artillery piece being good, although perhas a little bit too big? Anyone else notice the error here? Look at the names of the ships. Technically, you could say that these Clones are not brand new - seeing as they've already been handled. Would that bring the value of each trooper down? Who knows. What I can say though, is that a dodgy seller will lie and say it is brand new from some set they bought. People will be out to buy quite a few of these just so they can sell them on Ebay. While I'm here, is that just a chubby kid or is that index finger suffering from some sort of illness? Very swollen isn't it? i think it would be best to leave your minifigs in the bags, his sausage finger might be Contagious. i picked one magazine up at my local news agent and then i got another in from tesco. these seem to be selling out fast! 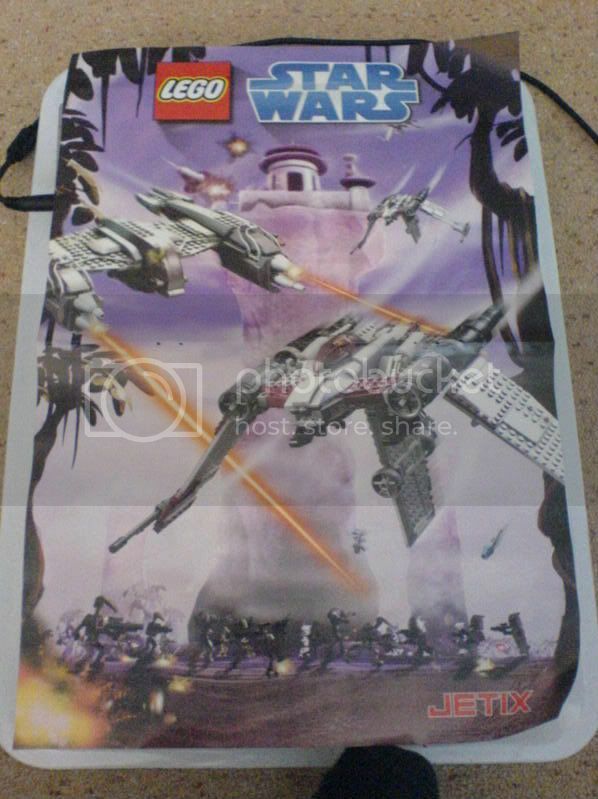 Is it possible to order this issue on-line ?